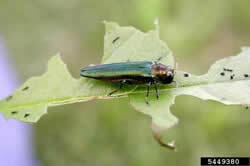 The Ash Protection Program (APP) is a reimbursement program for the chemical protection of ash trees from the emerald ash borer in North Carolina. As an important urban species, the APP will reimburse approved municipalities and communities a set rate for the treatment of ash trees. Please read through the Program Guidelines prior to submitting an application. All applications are due by 5 PM on February 21, 2019. Ash Decision Tree – Treat or Remove?